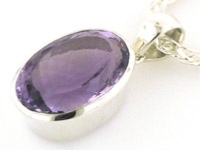 Here is the largest UK collection of semi-precious gemstone pendants. The choice is yours from Amethyst, Turquoise, Onyx, Quartz to Sapphire pendants and beyond: a wide range of colourful and elegant silver sterling gemstones pendants. These gemstone pendants have hand picked stones and all are set into sterling silver. Team up with one of our Italian silver chains to create your own individual pendant necklace. Our collections of silver snake chains and silver rope chains are popular and renowned for the quality and choice of widths and lengths. No matter where you live in the UK, your gemstone pendant is delivered free!